What the hell is going on with tennis? I've been watching some great matches for a week and-a-half now from the French Open at Roland Garros. By the way, why did the French name a tennis stadium after a noted World War I aviator? What's up with that? Unless of course the stadium's founding fathers had the sweeping, dipping and looping camera angles that the French broadcasters practice in mind when they chose a dignitary after whom to name the place. Sadly, in a huge upset, four-time French Open champion Rafael Nadal was defeated. Some 23rd seeded Swede (Robin Soderling) felled the mighty top-seeded player. And I think I know what happened. At the French Open the reddish-orange clay courts stand out in stark contrast to the military green of the billboards and stadium. It's quite different from the grass at Wimbledon. But the clay isn't the only colourful thing at Roland Garros. What the heck ever happened to "tennis whites", long the standard uniform of tennis professionals? I think things started to turn with the Williams sisters, Venus and Serena. When they hit the scene tennis fashion started to change. In fact, I think the reason they won so much early on in their careers was they knocked their opponents eyes out with the flashy cut and colour of their clothes! These days, colourful tennis clothes are, to aptly use a french phrase, de rigour. And the colourful look has jumped genders and now men players are loud and proud. For example, France's Gael Monfils has been sporting a banana-yellow tank top, even brighter than the yellow tennis balls. Number 2 seed Roger Federer strutted with a sea-blue jersey. 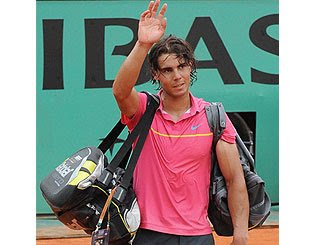 But the worst was the pink with yellow piping affair worn by Nadal. Why did he lose to the 23rd seeded player? Hell, he blinded himself! Good points Noname! It should be against the rules the wear a yellow shirt the same color as the balls. Quirky: Yeah, I was going to do something about even his balls being yellow but thought better of it. I think both players should be required to change color schemes each set. Just for variety's sake. At the beginning of each set, the line judges vote on the most creative outfit, and that player gets an extra service game for that set. Chris: That's almost where we're headed. What a raquet!